Where would we be without Hinton James? 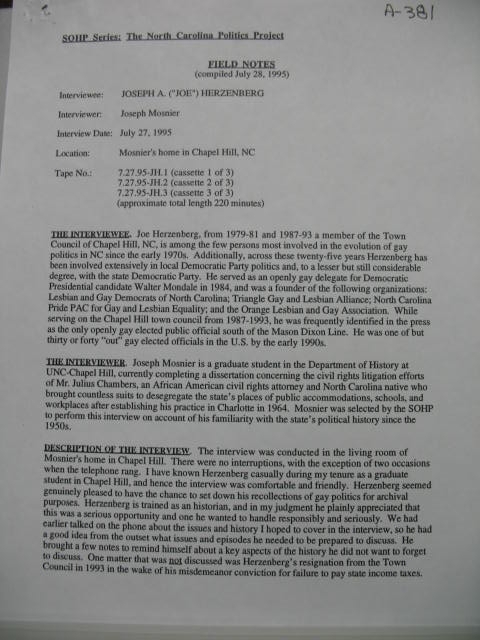 Oral History Interview with Joe Herzenberg, conducted by Joseph Mosnier, July 27, 1995. 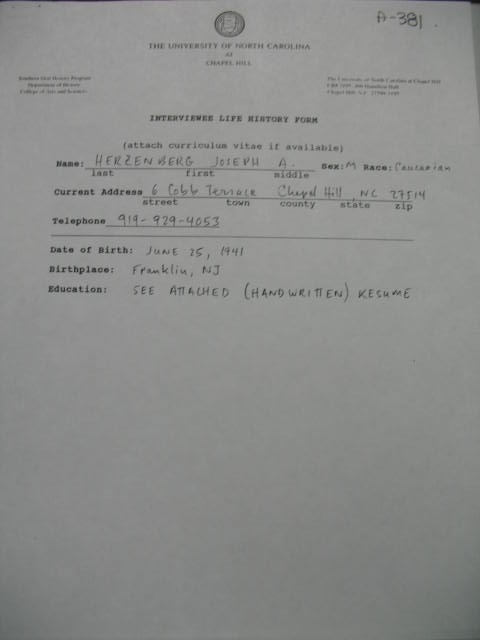 Interview Number: A-0381. Archived for listening as part of the Southern Oral History Program at the Southern Historical Collection Manuscripts Department in Wilson Libary, UNC-Chapel Hill. Nearly four hours in length, this was Joe's most in-depth, wide ranging recorded conversation about his life and times. 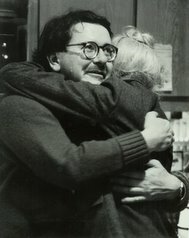 Having conducted several oral history interviews himself with figures like Anne Queen and the Rev. Charles M. Jones for the Southern Oral History Program during the 1970's, Joe was aware this interview was an opportunity to record what he had witnessed during three decades of immersion in the North Carolina political scene, as seen from his perspective as a historian, activist, and political strategist. 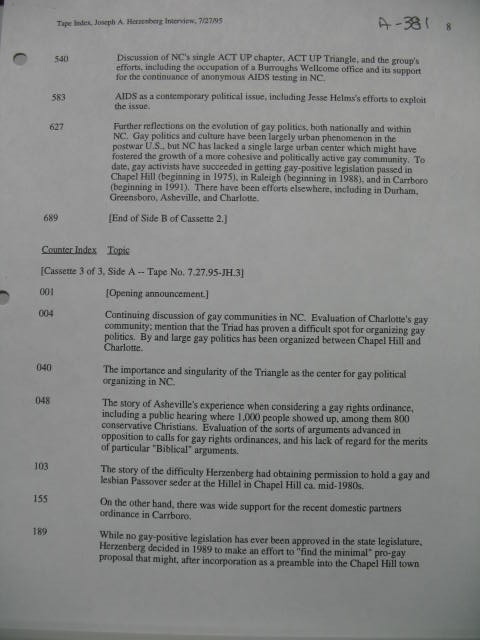 As described by his interviewer, Joseph Mosnier, Joe "seemed genuinely pleased to have the chance to set down his recollections of gay politics for archival purposes." 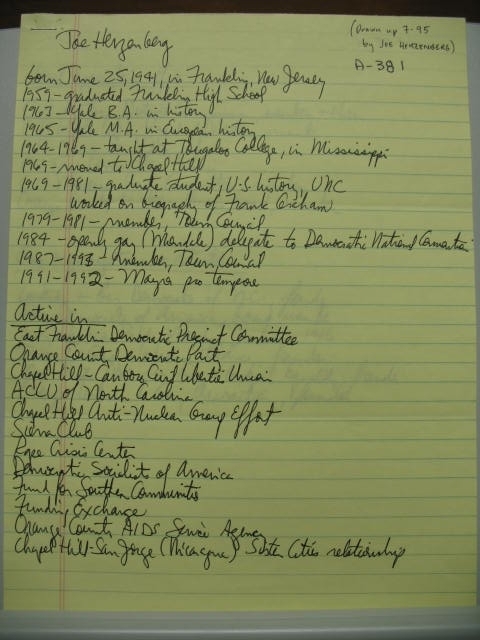 No transcript of this interview is currently available, but the interviewer's field notes, handwritten life history drawn up by Joe, and a tape log that summarizes the topics covered are all reproduced below. 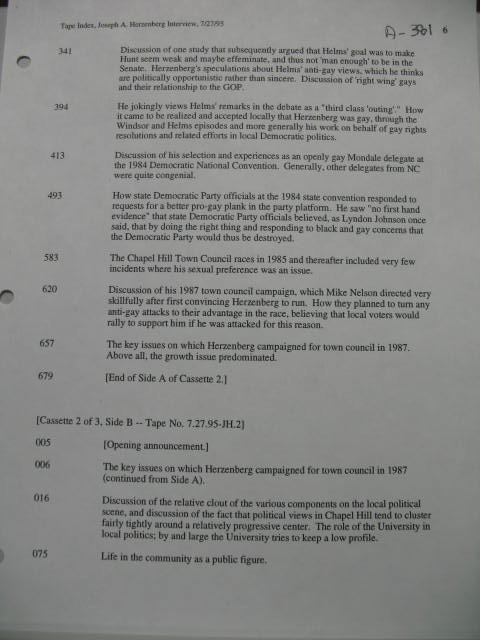 A lot of the notes I got from Joe were on leftover pieces of campaign literature from past elections. 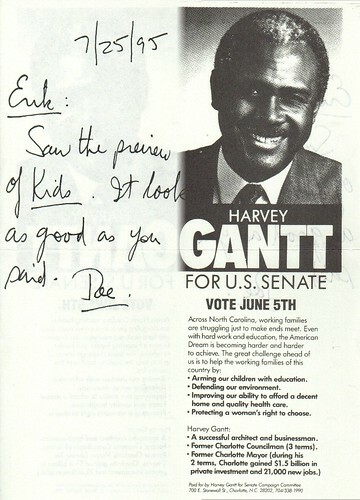 Even more so than when he backed Jim Hunt against Jesse Helms in 1984, Joe put his heart and soul into supporting Harvey Gantt's two campaigns against Helms for US Senate. CHAPEL HILL -- A plan for the town's first permanent history museum is taking shape. After months of research, a museum study committee appointed by the Town Council last year has come up with a detailed proposal for a Chapel Hill museum. The group's report says a museum could be up and running in two years if the town donates the former library on Franklin Street for its use. Support would come through grants from business and government, and private donations. The idea first gained popularity last year during the town's bicentennial celebration. Museum backers asked for space in the town's old library, and before long, yard signs popped up all over town supporting the notion of a museum. About $30,000 in pledges also poured in. 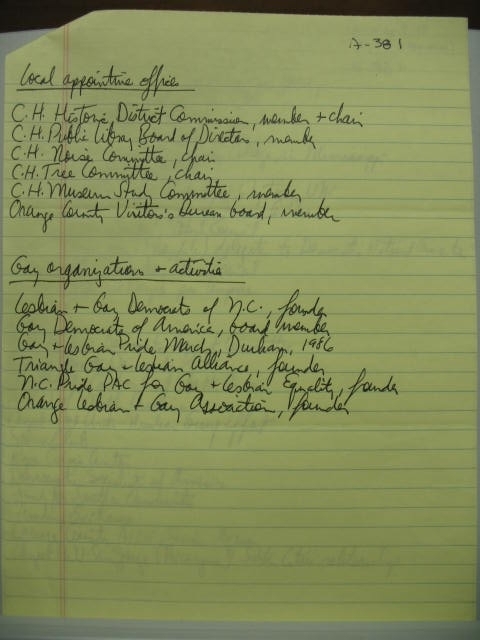 A 12-member study committee spent the past year researching museum funding possibilities and visiting other museums across North Carolina. Members spent more than 1,000 hours on the task. They were encouraged by what they found. They looked at eight museums in North Carolina, with annual budgets ranging from $120,000 to $5.3 million. A few were in small towns. "There are towns with far less in financial resources than we have that have made quite a go of their museums," said committee member Joe Herzenberg. Some are run by local governments; others are owned and operated by non-profit corporations. 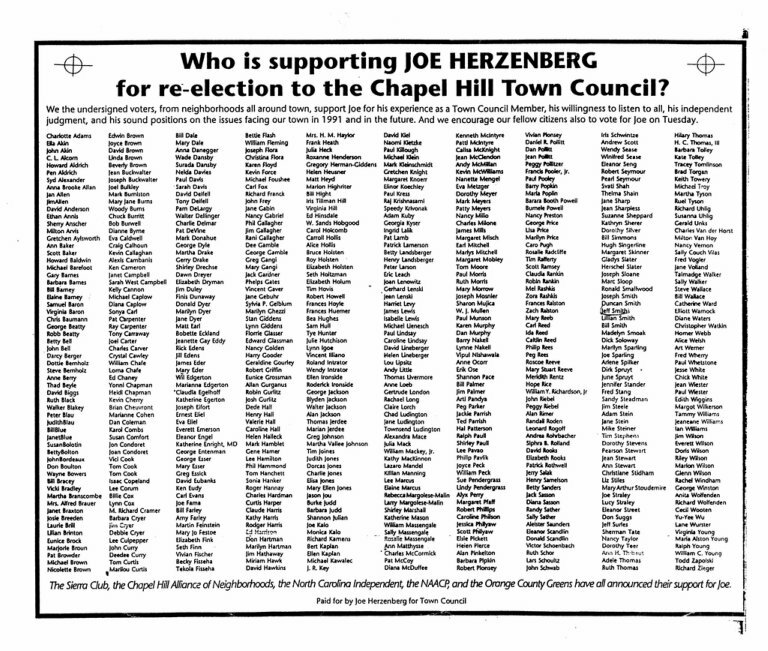 Herzenberg and other members think the non-profit organization may be the better way to go. "I'm not the first one to say this is not the best time for local governments to be thinking about taking on new departments," Herzenberg said. The key, committee members say, will be the use of the old library. Having a place to begin part-time museum operations is the only way to get major support through grants and corporate donations. During the two-year beginning phase, the museum would probably require about $44,000 in operating money each year, the committee estimated. Herzenberg said the success of the bicentennial demonstrated the town's interest in history. "We've only begun to tap the barrel of volunteers in this town," he said. "The main questions are time and money. But I think there are a lot of interested and clever people who want to make this happen." In the old days, during the argument, mainly with the University of Georgia, over which state university came first, Frank Graham put it this way: the University of North Carolina was "the first state university to open its doors," and those are the very words on the state highway historical marker on East Franklin Street at the foot of McCorkle Place. And it was on Feb. 12, 1795, that Hinton James, after his trek up from Wilmington, arrived in Chapel Hill, became the first student here, and thus initiated the active life of the University. After two hundred years of comings and goings, it is appropriate to acknowledge this anniversary and to express our gratitude to the two centuries of students who have provided the main reason for our town (and now for Carrboro too). Labels: Joe_Letters_to_the_Editor, Where would we be without Hinton James? CHAPEL HILL -- Even though Chapel Hill has the toughest gun law in the state, some town residents say it's not enough. 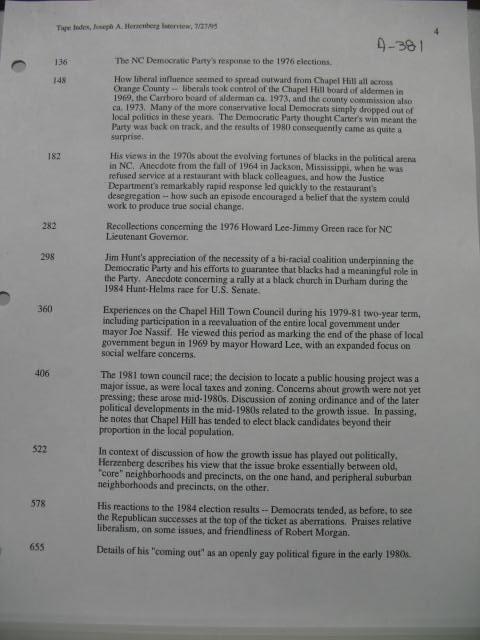 In the wake of last week's shooting rampage that left two dead and three wounded, gun control was again on the Chapel Hill Town Council's agenda Monday. 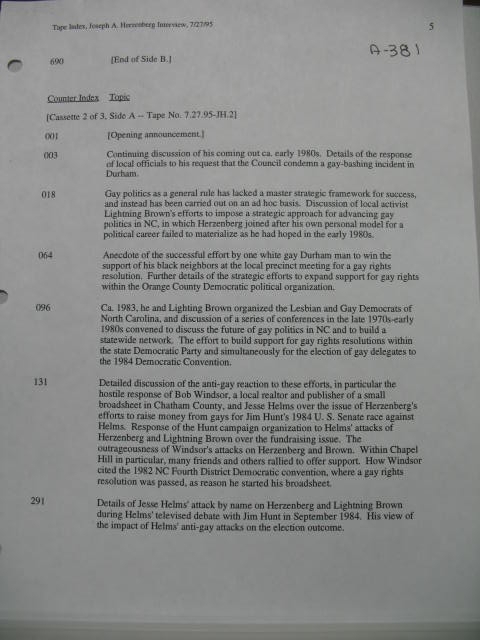 A petition with about 1,000 signatures was submitted calling for an outright ban on all guns in Chapel Hill. Others suggested the council start with something a little more modest, such as passing an ordinance that would prohibit someone from carrying a large gun in the town limits. "It seems to me a lot of people in Chapel Hill think if someone walked around the neighborhood with a large gun, that is threatening," said Joe Herzenberg, a former Town Council member and Cobb Terrace resident who made the first 911 call to police when the shooting started last week. "It did occur to me that what that guy was doing was not illegal until he started shooting. 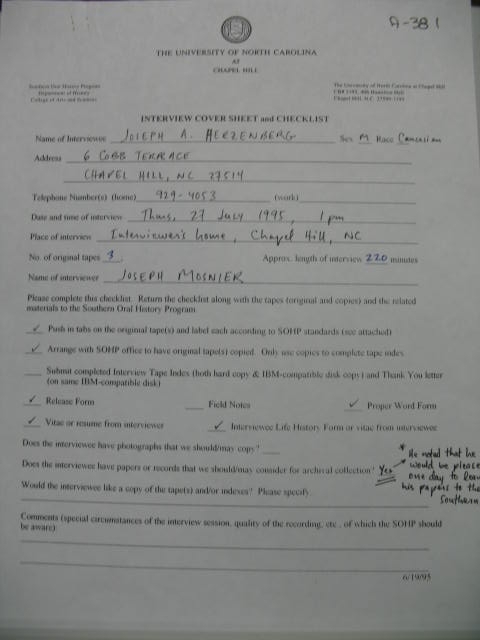 I think that's wrong and I think most people in Chapel Hill think that's wrong." 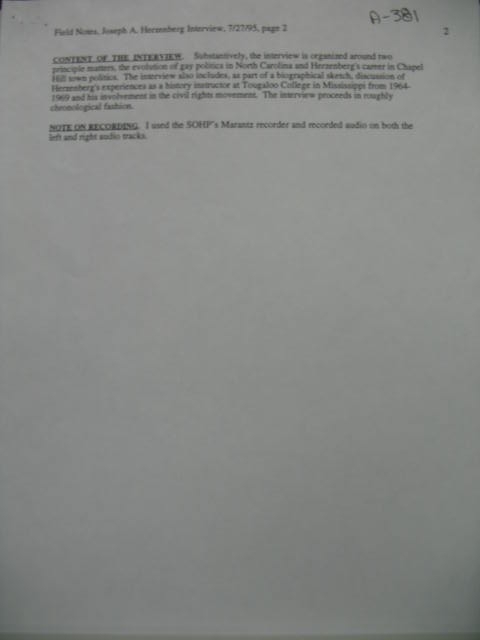 The following is a transcript of the first two 911 calls -- of about 20 -- from residents reporting the shooting spree on Henderson Street Thursday. 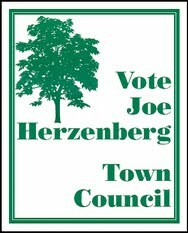 The first call, from Joe Herzenberg, former Town Council member, came in at 1:48 p.m. Herzenberg, calm and articulate, was calling from his home at 6 Cobb Terrace. Operator: Orange County 911. 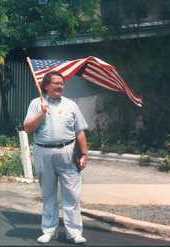 This is J.P.
Joe Herzenberg: There is someone with what looks like a rifle. JH: On Henderson Street, at the intersection of Henderson and North. In downtown Chapel Hill. JH: Henderson and North, yes. JH: He's been firing. He's fired about seven times. I can't see him well enough to describe him. O: Can you tell if it's a white guy or a black guy? O: And that just happened? O: Hold on just a moment. JH: I'm going to go look, I'll come right back. (pause) I can't see him. O: OK. Can you tell me if it's a white male or a black male? O: White male. Can you tell me any other description of him? JH: He had, it looked like a blue, dark blue coat on with a hood. O: OK. Which direction was he walking? 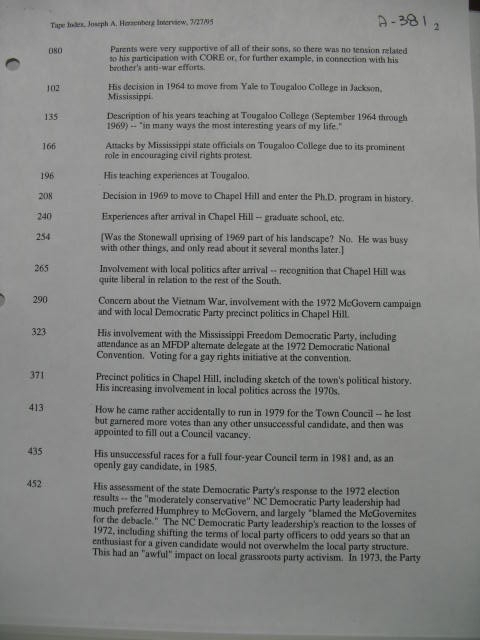 JH: He was walking south, toward town, toward Franklin Street. O: Can you tell me about how old he was? JH: No. I would guess he's under 30 but I'm not sure. O: OK. Can you tell me any more about him? Just carrying the rifle? Shooting the rifle? JH: He's still shooting it. I mean, it looked like a rifle. It might have been an air gun or something. I'm not very knowledgeable about those kinds of things. O: OK. What is your name, sir? O: And your telephone number? O: OK, we've got officers in the area now. Thank you. CHAPEL HILL -- Two people are dead and three wounded after a man opened fire on passers-by, vehicles and police at Thursday afternoon on Henderson Street. The shootings appeared to be random, according to police officials. The gunman allegedly began at Cobb Terrace, an extension of Henderson Street, and walked towards Franklin Street carrying a WWII-type, M-1 30-06 high-powered, semi-automatic rifle. "I just happened to look out my window. There was nobody else on the street," said Cobb Terrace resident Joe Herzenberg, one of the first to call 911. "He was carrying this rifle, and I was thinking, 'Is it illegal to carry a rifle on the street?' " Herzenberg said. "And while I was thinking, he turned to the house next door and started firing on it. ... He was actually killing somebody." The gunman shot and killed two people -- first Ralph Walker, who was standing on the front porch of a rooming house at 2 Cobb Terrace, and then, a man on a bicycle, who died in front of Phi Mu Sorority on Henderson Street, police officials and eyewitnesses said. Joe Herzenberg looked out from his second-floor window and was astonished to see a man walking along Henderson Street casually clutching a semi-automatic rifle. "I really wondered whether he was violating the law," Herzenberg says. That question became academic seconds later. CARRBORO -- Throngs of people literally created a warm reception on a cold Sunday afternoon for the AIDS Service Agency of Orange County's open house. Cars lined both sides of North Greensboro Street for several blocks as neighbors, agency members and supporters came to see what had taken three years to realize: a home for people who have AIDS. "There was such a need. I never really lost hope that it would be built some day," Agency President Joe Herzenberg said. In about two weeks, the first residents are expected to move into the one-story brick house at 1700 N. Greensboro St., according to Herzenberg. "They've done a wonderful job. They've managed to make what could have been a clinical environment very homey," Mike Nelson said. He helped during the fall fundraiser at Crooks Corner which raised $25,000, according to Nelson. For many of the residents, it will mean a roof over their heads rather than sleeping on the streets and in cars. "If you're too sick to work and you don't have the support of family, it's awfully hard to pay rent and buy food," Nelson said. "We probably need 10 homes," he added. CARRBORO -- A new group home for people with AIDS welcomed friends, politicians, supporters and neighbors, some of whom once opposed its construction, during an open house Sunday afternoon. Well-wishers as well as the curious toured the six-bedroom house at North Greensboro Street and Robert Hunt Drive. The house is intended to provide a less expensive alternative to a hospital forpeople with AIDS who desire a homelike place to live while receiving treatment. The road to opening the house has been filled with roadblocks, said Joe Herzenberg, a member of the board of directors. "This has been a long and very frustrating experience, but we're happy," he said. After being turned down repeatedly for grants and facing opposition from the neighbors, the board was excited when construction actually began, Herzenberg said. "When they were building it, I came out here almost every day to see every brick added," he said.